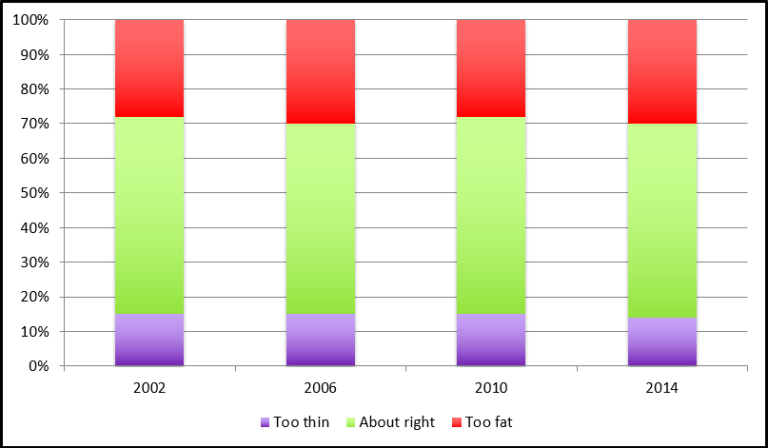 The perception of their body image among Canadian students in Grades 6 through 10 remained relatively stable between 2002 and 2014. Between 28% and 30% felt they were too fat and 14-15% felt they were too thin. Just over half, 55% to 57% thought they were just right. More children feel they are too fat (just under a third) than are actually obese (less than one fifth). Feeling fat can lead to unnecessary stress and unhealthy attempts to lose weight.